The FerriBox™ insulated container benefits from a unique lightweight construction combining the durability of a corrugated polypropylene outer skin with the thermal performance of an integral insulating core. We offer a choice of materials for the insulating core (determined by the thermal performance you require); the colour of the corrugated polypropylene outer skin can be selected from a wide range and your corporate identity can be overprinted if desired. The FerriBox™ is available for next day delivery nationwide in four standard sizes (as detailed in the table below) or can be custom made to order to meet your specific size / performance requirements. 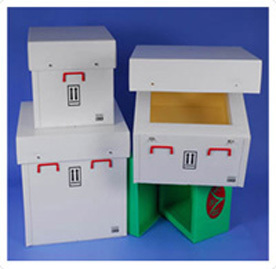 When used in conjunction with UN specification internal packaging, the FerriBox™ complies with the Dangerous Goods Regulations allowing the safe transport by air and road of diagnostic / biomedical specimens and infectious substances. 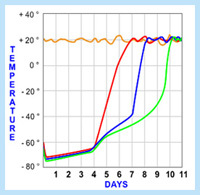 The graph below shows some typical examples of the thermal performance achieved by the FerriBox™ at an ambient temperature of +20°C when a frozen specimen of a particular volume is packed in the specified weight of dry ice.